Tofu is one of those vegan staples that I can't imagine my diet being without, but I haven't always felt this way. When I first went vegan several years ago, I always wondered what tofu was like, but it seemed way too strange to try. Heck, it comes in a package with all that water...what are you supposed to do with that? It's safe to say, I kept my distance from tofu and stuck with my veggie burgers and beans. But after seeing some intriguing recipes, I took the plunge and tried it. It wasn't bad, but it wasn't good either. This is mainly because I had no idea how to prepare or cook with it. So I simply drained the water, broke it up into crumbles and added it to a chili. Whoa whoa... beginner vegan...hold up a sec there! Little did I know the tofu needed to be PRESSED, and on top of that, FLAVORED so it was as bland as could be. So, to help prevent you from making some "tofu beginner" mistakes like I did, I'm going to share some tips about what tofu is, how to cook with it, as well as some of my favorite tofu recipes... particularly a "Homemade Mongolian BBQ Stir-Fry". So fasten your seat belts, rip open your nearest package of tofu and let's get started. Short answer: tofu comes from soy beans. Long answer: tofu is made from soy beans that are soaked, blended and from there separated out into soy milk and soy pulp. From there the milk is heated until it forms "curds"...those curds are then pressed into the familiar tofu blocks that we know and love. Okay, so I probably left out a few steps, but I don't want to bore you with the details, so if you want to know more about how tofu is made, check out this video called, "How It's Made: Tofu" or another video called, "Ever Wonder How Tofu Is Made?" by Amy's Kitchens. They can probably help explain any questions you may have. and I'll be your tour guide. It's also important to note that there are several types of tofu on the market: extra firm, firm, and silken. The different forms can be used for different dishes, and their name explains their texture. I pretty much always use extra firm, because it resembles "chicken nuggets" from back in the day, and it hold together nicely in stir-frys and pasta dishes. Firm tofu is a bit softer, I use it as a "tofu ricotta cheese" for a vegan lasagna recipe shown below. And silken tofu is very runny/liquidy and most often used in smoothies and vegan desserts. I'm sure there are lots of great brands of tofu out there, but I like the Nasoya brand shown above. It is often one of the only brands offered at my local grocery store. My local health food store has a few other varieties, but I especially like this brand because it is organic. I always make sure to buy my tofu organic because I can rest assured knowing that it is NOT genetically modified (since most conventionally grown soy foods are genetically modified). A key part of cooking with tofu is learning how to prepare it. Luckily, it's not too difficult. The main goal: to expel as much water as possible from the tofu as possible. However you go about doing that is fine. Personally I use a TofuXpress, which presses the tofu for you...it is probably the best $40 I've spent in a long time. I know that price seems steep for a little piece of plastic, but trust me it works and it can save you a lot of time! the lid, and the top that screws on to press the lid down. until it clicks and then press it for as long as you would like. Here's the end result: perfectly pressed extra firm tofu. 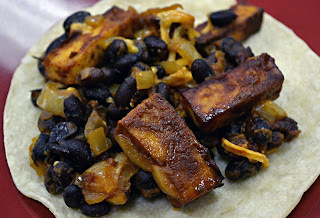 Don't have a TofuXpress and really want to make tofu for dinner? No problem, do what I call the "ghetto press". I rocked this method for a long time and it helped me get my tofu pressed (in an unconventional way). Watch the video to see the exact pressing method I'm referring to, but basically it consists of draining the water from the package, wrapping the tofu with cloth napkins and squeezing the tofu to get the water out. Sometimes I would go through 5-6 cloth napkins (you could use paper towels) just to get as much water as I could out of it. Want to up the effectiveness of this method? Keep your tofu wrapped, then place bowls, plates, books, etc. on top of it to create some pressure and increase the "press". Be careful though, if you stack it too high the uneven level of the tofu could lead to some broken dishes...not that I know from experience or anything ( ; Nonetheless, this method will help you get more water out of the tofu. I would let the tofu sit like this for at least an hour. I'm sure there are more, but these are the two I used the most! 2. Bake at 375 degrees for 30 minutes. back in the oven to cook for 15 more minutes. just asking to be eaten! As I mentioned in the video, one of my favorite recipes is a Homemade Mongolian BBQ Stir-Fry. If you've followed my blog long, you know I love Genghis Khan Mongolian Grill here in Kansas City and this recipe was inspired by our many visits there. Genghis Khan on the outside. it up for you. It's pretty entertaining! I love Genhis Khan so much, I went there when I was 40 weeks pregnant on Avery's due date for a "Due Date" party as you may remember from this post. Apparently the food must have helped Avery settle in even more because she still didn't make her grand appearance until 11 days later. But hey, at least I got a good meal out of it! 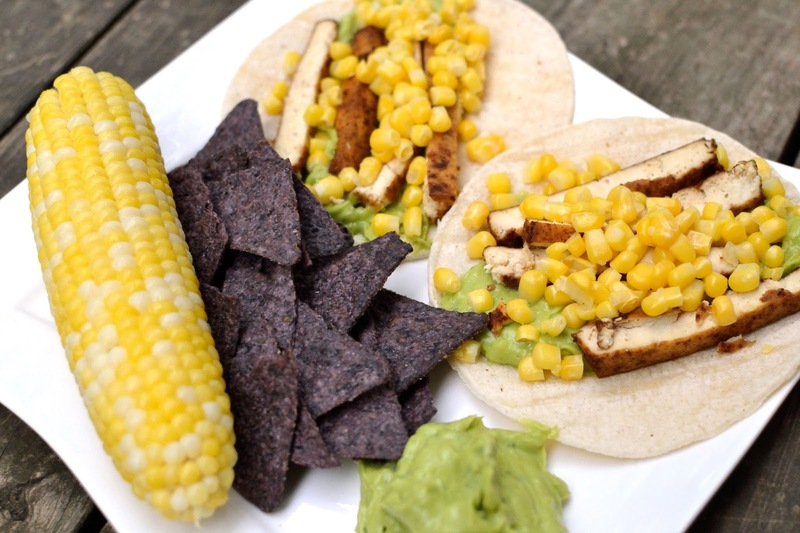 corn, cilantro and chipotle powder. The best thing about this dish is that you can personalize it to fit your taste buds. I like broccoli, corn, mushrooms, and onions...you may like tomatoes, celery, and green peppers. That's cool, do your thing! So while I suggest some veggies and spices, feel free to use whatever you would like. 2-3 gloves of garlic, minced...I use my "Garlic Twist"
I use a carbon steel wok. so they won't dry out before being added to the stir-fry. 2. Chop your veggies and set them up in buffet-type style. and cook in the oven at 375 for 30 minutes. Flip the tofu halfway. Once done add to the stir-fry. 4. Warm your wok/skillet to medium-high, and add your veggies. Saute for 5 minutes or so. I place a glass lid over my veggies to help steam them a bit quicker. 5. Add your tofu to the pan, followed by your spices. I use 1-2 tsp. chipotle powder, 1 tsp. Braggs Liquid Aminos, 1/2 tsp. salt, 1 Tbs. Trader Joe's Sweet Chili Sauce. 6. Now add your noodles, stir to combine and then serve. "BBQ Black Bean and Tofu Burritos"
topped with corn and some of my "Smooth & Creamy Guacamole"
about how I make this lasagna, gluten-free. So there you have it... tofu in a nutshell. 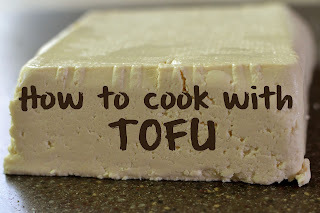 I hope this helped answer some questions you have about tofu, what it is and how to cook it. If you have any other tips to add to the list, please share them below...we're all still learning when it comes to cooking in general, especially when it comes tofu! So even though I've had some experience with it over the past few years, I know there's always more to learn. I'd love to hear any of your favorite tips! Or do you have a favorite tofu recipe? Share it below!